These Coffee Chocolate Truffles Balls are delicious flavored with 2 kinds of chocolate and Irish Cream for a sweet treat that satisfies your craving- did I mention the tasty crunch from crushed pecans? They are pretty simple to put together though you wouldn’t guess it since the final result is so pretty. They make a wonderful gift packaged up in layer’s of tissue paper… I am thinking they would be perfect for Valentine’s Day. In a saucepan over medium heat bring Heavy Whipping Cream to a boil. Remove from heat and stir in the Pecans and Irish Cream. Let cool 10 minutes then place in refrigerator at least an hour so the chocolate sets up. Grate the remaining Dark Chocolate with a fine grater. coat and place on wax or parchment paper. Refrigerate until ready to serve. Take out about 10 minutes before serving. 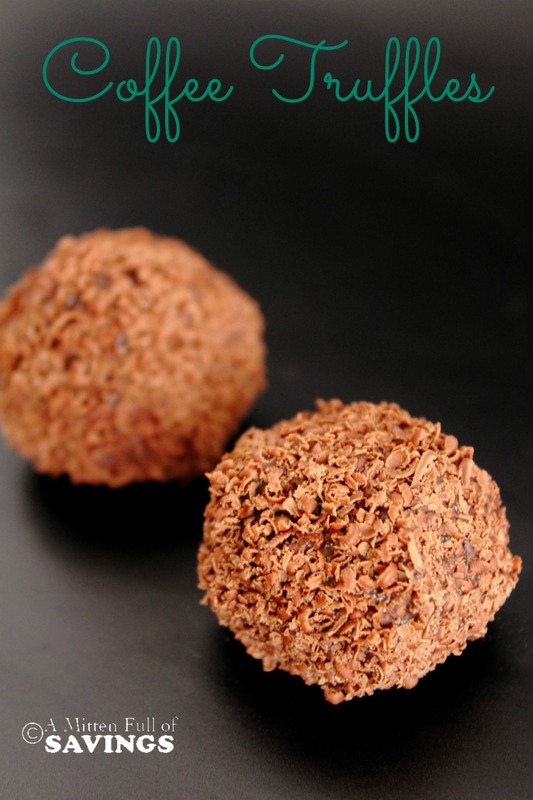 And there you have it- a super easy recipe for Chocolate Truffle Balls with coffee! If you try it out, come back and let me know what you think! Love Coffee? Here’s a few other coffee recipes that I think you will love! Pardon me while I clean the drool off of my keyboard! These look absolutely amazing and I cannot wait to try them!! !